Last night I arrived home to find a care package from Winter. Inside, along with my favorite New England junk food and burned music was this funny looking string doll, Buster. 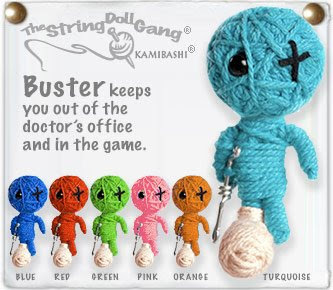 On his tag, “Buster keeps you out of the doctor’s office and in the game.” Oh boy, did I need him! Last week’s doc appointment wasn’t stellar. Worn cartilage meant triathlon and marathons might not be in my future after all. Contemplating that sent me in a tailspin. What a difference a week makes. New doctor. New perspective. I arrived this morning with fingers crossed. I was initially seen by a young doc. He really gave my leg some scrutiny and then ordered an X-ray. I pouted. “What?” he asked. “It’s just it’s been over two months. I don’t want to wait for results and another appointment.” “You won’t. We’ll do it right here, right now before you see the doctor.” “Ohhhh,” I said, relieved. I waited in the lobby with another patient. A nice lady who was probably around my age. She’d had two knee replacements. Her brother won three Olympic medals. We swapped stories. She ran for 30 years – sprinting and long-distance. She said her worn cartilage came on suddenly. That wasn’t what I wanted to hear. She was cool. A former dancer and marathoner. Then he examined my legs very thoroughly. “Your hamstrings and ITB are so tight, you’re asking for an injury.” He showed me an exercise to do in a doorway. He instructed me to do that three times a day. And ice my knee twice a day, but not in the morning. He prescribed lots P.T. too. And then he looked at my feet. “Take off your shoes, “ he said. “Your feet are flat. You need orthotics to keep your knees aligned better.” He wrote me a prescription for orthotics. “You should be pain-free and ready to run in 4 to 6 weeks. If not, come back and we’ll do another MRI.” I’m keeping Buster in my pocket until mid January – just in case.